Amazon have announced a new range of tablets including the Fire 7 for Kids and the Fire 8 for Kids. Amazon have upped the spec without increasing the price and added a Fire 8 bundle for kids. There's a launch promotion which gets you 20% off three of the new devices (including the kids bundles) which is handy for families with multiple kids. For the previous edition of the Amazon Fire we put together a guide for deciding whether to pick the kids bundle or the basic edition (most of the discussion is still relevant for the new models), bottom line: the kids edition is great value for money if your family will make use of the extras, if not and for older kids, tweens and teens, buying the basic edition and then adding a decent case is the way to go. 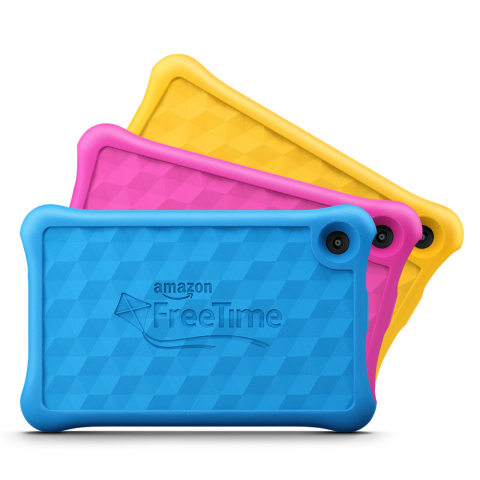 Having an 8" Amazon Fire for Kids model is new. Previously only the 7" was included in a bundle for kids. Going from a 7" to an 8" screen currently costs an extra $30 whether you go for the basic or kids edition. That's quite a big percentage of the overall cost but it does make quite a difference to the experience, some apps just work better with a bit more space. It's heavier which might be a big deal if you regularly carry a tablet in your purse or bag. It's not just the screen size that's different. You get larger SD storage and a larger battery for more time between charges, up to 12 hours sounds pretty impressive. There's also a move from mono to stereo sound. What Can Kids Do with a Fire Tablet? We're fans of the Amazon range of tablets for sheer value for money. No they're not iPads but they don't cost anything like as much. That makes them affordable to a lot more families and means that kids can have their own device. We're not keen on the trend for kid tech to come in pink and blue, but at least there's a nice neutral sunny yellow that you can choose. The Amazon ecosystem is gradually gaining more apps so there's a lot more to choose from than there was a few years ago. Some of our favourite apps are there too.